Can the 2019 Hyundai Kona get any better? Apparently, the answer is yes! The 2019 Kona Electric Vehicle offers impressive fuel efficiency and technology features to make your drive even better than before! Check out the Hyundai Kona EV below. How far can I go in the Hyundai Kona electric vehicle? The 2019 Kona EV isn’t just able to putter around the city. Its EPA-estimated efficiency was calculated using the 64.0-kWh battery. Take this electric vehicle on your family vacations, because it can go up to 258 miles when it’s fully charged! After that, you’ll need to charge it again, but don’t worry! The Kona EV has a port in the front grille to make the charging port easily accessible. Read more: What are the differences between the 2019 Hyundai Kona trim levels? The 2019 Hyundai Kona EV doesn’t skimp when it comes to technology features. 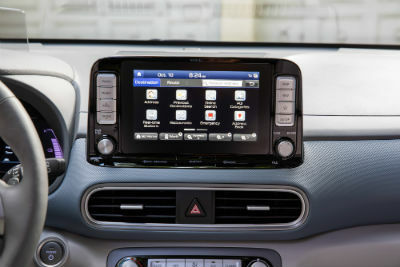 Don’t forget to check out the 8-inch touchscreen with the Heads-up Display and navigation. You can also listen to your favorite music and playlists with Apple CarPlay® and Android Auto® as well! But the Kona EV has more than just entertainment features. You can also see a variety of driver-assist features on this exciting model, including Lane Keeping Assist and the Forward Collision-Avoidance Assist. Is it time to get your next vehicle? Come on over to Coastal Hyundai! You can find your future hybrid or gas vehicle at our dealership. We are excited to help you find your future vehicle and we would love to tell you more about whichever model you choose, so feel free to contact us with any questions you have! Whether you are shopping for new or used vehicles, our team is here to help you. This entry was posted on Friday, January 25th, 2019 at 12:54 pm	and is filed under Hyundai Kona, Technology. You can follow any responses to this entry through the RSS 2.0 feed. You can skip to the end and leave a response. Pinging is currently not allowed. Which Hyundai Vehicles Can Tow?